On the third floor of Doe Library, just off the path of the building’s bustling passers-by, a large, sunlit room overlooks Sather Road. Its walls are, in fact, bookshelves, and filling the white concave from floor to ceiling is what seems like an endless mosaic of books. A century ago, the space was the Library of French Thought, holding a 12,500-volume collection. Walking through the antique wooden doors today, the room, called Doe 303, feels something like a secret. For Hari Srinivasan ’19, it’s a thousand secrets, all at once. Those colorful spines are not decoration but vessels — from which an unfathomable stream of information is now spilling into the air. Which, all together, has made this particular interview a bit inconvenient. When Srinivasan steps into a new environment, he’s often bombarded by sensations such as these. Srinivasan has nonverbal autism accompanied with sensory dysregulation. Unfamiliar spaces can spark kaleidoscopic frenzy, and overstimulation can send his reflexes into overdrive. At times, the sensory overload can be ecstatic. (“The rhythm of a waterfall can, for instance, touch the very soul,” he writes in a Daily Californian article.) But as a student at UC Berkeley juggling midterms and the like, it can also be terribly frustrating. During one review session for a midterm, Srinivasan recalls, the air vent in the Mulford Hall lecture room felt so loud, he could not focus at all. 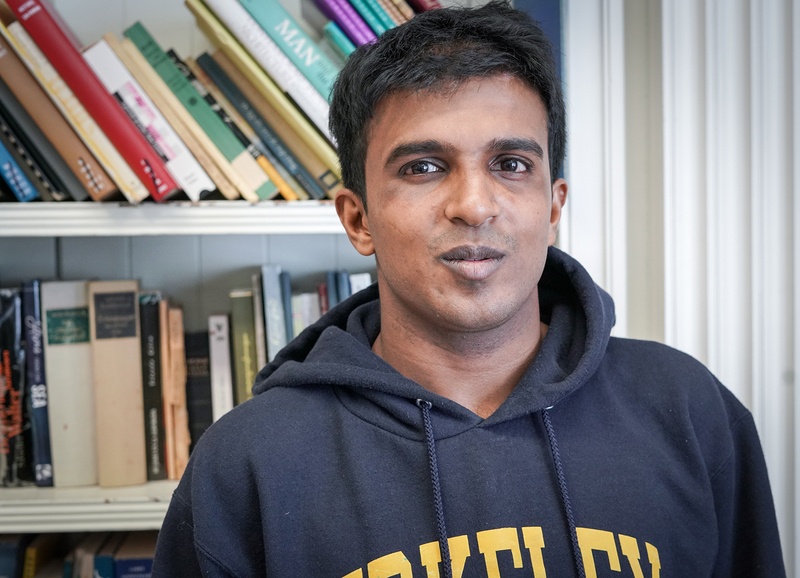 Srinivasan is one of about 2,700 students in UC Berkeley’s Disabled Students’ Program, or DSP, which works with units across campus to provide accommodations and services to students with disabilities. This past year, noting Srinivasan’s challenges, DSP reached out to the Library. Together, they secured a regular space for him in Moffitt Library, where he could take his exams free of distraction. “The familiarity with a room and the sameness brings in a sense of comfort,” he says. 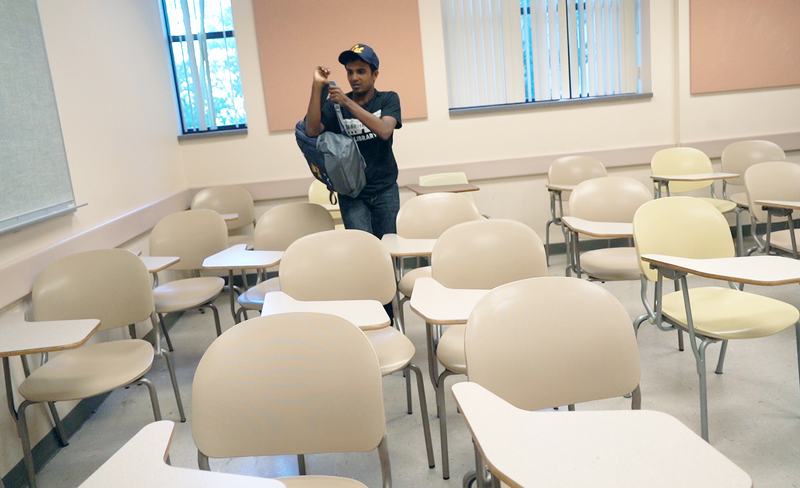 While Srinivasan’s particular case is uncommon — he is one of a small handful of students with nonverbal autism to ever attend UC Berkeley — the need for space on campus is certainly not. DSP has designated proctoring sites on campus where students can take exams with a range of accommodations: extra time, assistive technologies, and fewer people in the room, for example. But when exam season comes around, there are always more requests than DSP alone can accommodate. So each semester, the Library looks within its walls — usually in Doe and Moffitt — to find the spaces to meet those needs. In fact, the hunt for space is one of many facets of that alliance. And as the Library continues to improve its services, technologies, and spaces — including the renovation of Moffitt — DSP has been a key voice in the journey. When Srinivasan was first deciding where to attend college (he was admitted to every UC school he applied to), one important piece of the puzzle was the function and scope of the campuses’ programs for disabled students. He was encouraged by Karen Nielson, director of Berkeley’s DSP, who convinced him of the program’s commitment to listening to students and thinking innovatively to meet their needs. But aside from those careful considerations, Berkeley had already been his dream school. As a trove of documents and oral histories in The Bancroft Library details, Berkeley was, in fact, a major catalyst in the fight for disability rights and the birthplace of the independent living movement of the ’60s and ’70s. The movement, led by Ed Roberts, a student with polio, demanded that society reform its systems and institutions to provide those with disabilities equal opportunity and autonomy within their daily lives. “Berkeley is a founder of the disability movement,” Velasquez says. Berkeley established one of the first disability services programs in the country, she notes — a legacy that continues to push DSP to fight for change. One of the most important shifts, in the Library at least, happened about five years ago, when students in DSP demanded better access to the Library’s collections. Universities are required by law to provide accessible versions of required course readings. But for students wanting to go beyond the syllabus, many of the Library’s resources remained just out of reach. In response to students’ concerns, the Library — with a troop of staff from Interlibrary Services, Library IT, Imaging Services, circulation desks, and more — developed a full-scale scanning service. Through OskiCat, the Library’s online catalog, students registered with DSP can request any item be converted into a digital format. From there, students can run the file through free software to create accessible versions of the material — whether MP3, e-book, or Braille. Now, the Library is working with faculty on campus to extend the scanning service to instructors with disabilities. The program is still in the works, Dupuis says, but a pilot group of faculty should be able to test the service in a few months. Moving forward, the Library is also working to improve access to its physical spaces, and the ways students navigate that system. In consultation with DSP, the Library is working to revamp a feature on its website that allows students to search for a study space according to the exact set of accommodations they require. For Srinivasan, whose sensory dysregulation makes studying in the library difficult at times, one crucial — and, too often, scarce — resource is private study rooms. Space is, of course, one of the most precious resources on campus, Dupuis notes. But as the Library blueprints the next phase of Moffitt Library’s transformation into the Center for Connected Learning and looks critically at the Library’s existing spaces, feedback from DSP and the needs of its students will be a guiding voice in the equation, she says. “We have the ability to make a change for our students — and the voice to make that change,” Velasquez says. Srinivasan chooses a seat for class in the Valley Life Sciences Building in August. For Srinivasan, the struggle to find his own voice started as a child. It wasn’t until he was 13 — when he learned how to type — that he found a way to speak. And he has kept typing ever since. This past spring, Srinivasan joined the Opinion section of The Daily Californian, UC Berkeley’s student newspaper. He wrote a semesterlong column titled “The Person Inside,” in which he spoke of his experience with autism and the challenges students with disabilities must routinely overcome. Aside from advocating for change in his personal writings, Srinivasan is also working for campus psychology professor Stephen Hinshaw as a research assistant, investigating topics such as how ADHD is best accommodated in the workplace and how to reduce the stigma surrounding mental illness. For his work, Srinivasan pores over countless academic articles provided through the Library, finding relevant studies and then synthesizing them for the research team. Srinivasan, who is currently majoring in psychology and minoring in disability studies, says the research has been an enlightening experience, widening his perspective of the issues at hand and training him in the art of academic research — his own career dream. But in Hinshaw’s view, Srinivasan is already doing just that, by simply sharing his truth. According to Hinshaw’s research, it is the stories and voices of those living with disabilities that push society toward understanding and, in turn, change. When someone reads Srinivasan’s column and gets beyond the surface appearance of autism to “what’s really going on in his mind,” Hinshaw notes, then that in itself is humanizing and helps to defeat the stigma. So Srinivasan keeps writing. He recently interviewed a renowned neuroscientist for the Daily Cal and will be moving over to the newspaper’s Arts & Entertainment department this semester. And in the signature of his emails, you’ll find links to Srinivasan’s many writings: articles, academic writings, and a personal blog — a rabbit hole into Srinivasan’s mind and, of course, the person inside.